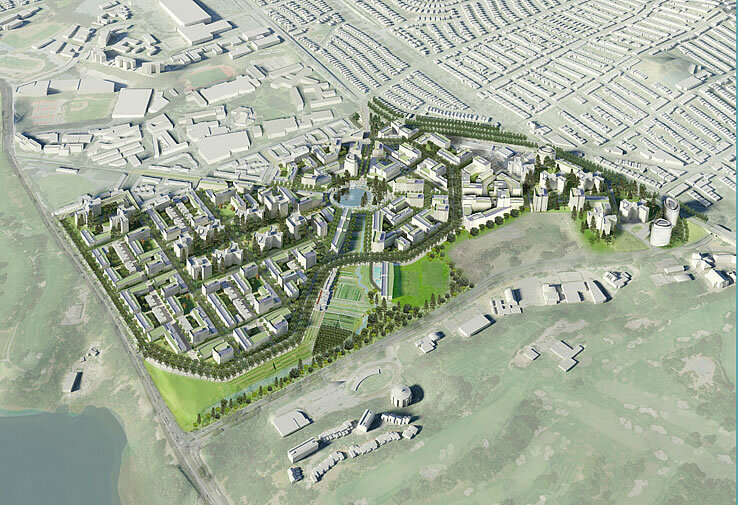 The massive redevelopment plan for Parkmerced includes 5,679 net new units of housing, for a neighborhood total of 8,900; a network of new neighborhood parks, athletic fields, greenways and an organic farm; new underground garages on the west side of the site to discourage casual car usage by residents concentrated in buildings on the eastern side of the site; and a rerouting of MUNI’s M Ocean View line from 19th Avenue through the development, along with re-designed streets, bike paths and other transportation improvements. And if everything goes as currently planned, construction for the first phase of the three-decade project, which includes the building of 1,668 housing units, of which 222 will be one-to-one replacement units for those demolished during Phase One, has been scheduled to commence in early February 2016. Phase One will also include 3,500 square feet of retail, along with street improvements, public open spaces and community gardens on the western and eastern sides of the site. Subphase A – Construction of 390 new units, of which 56 units will be Replacement Units for those demolished in subphase C and D, and a two-level, below-grade, garage for 453 cars. Subphase B – Construction of 567 new units, the demolition of the two existing above-ground parking garages for 740 cars, and the the construction of two below grade parking garages for a total of 473 cars. Subphase C – Construction of 333 new units, of which 66 will be Replacement Units to replace units demolished in Phase 2, and a below grade garage for 618 cars. A maintenance building, 10 units on block 37W, and 28 units on block 34 will be demolished. Subphase D – Construction of 378 new units, of which 100 will be Replacement Units to replace units demolished in future Phase 2, 3,500 square feet of ground floor retail oriented towards a new neighborhood commons, and a below grade parking garage for 66 cars. 18 existing units on block 19 will be demolished. The overall Parkmerced redevelopment plan includes 230,000 square feet of retail, 80,000 square feet of office space, a 64,000 square foot community center, and a replacement preschool as well. Parkmerced, which was named to the Cultural Landscape Foundation’s “Marvels of Modernism” list in 2008, was originally developed between 1941 and 1951 with 3,221 units of housing for veterans returning from World War II and was designed to be “a city within a city” by architect Leonard Schultze and Associates, with landscape design by Thomas Church and Robert Royston.